Some associate the word “green” with money. Others may associate “green” with envy. But to some in Charlotte, the word “green” opens up the doors of possibility, environmental sustainability, and social responsibility – thanks to the Charlotte Green Team . In August, the Charlotte Green Team held a vendor fair at the Charlotte Convention Center in conjunction with their quarterly meeting. Organizations and companies such as CBS Radio, the Charlotte Checkers, Rose Transportation, the U.S. National Whitewater Center, and the Westin Charlotte were in attendance, networking and presenting their latest green initiatives. Co-founded by Mary Tribble, CSEP, and Tim Newman, CEO of CRVA, the Charlotte Green Team is a consortium of organizations with a goal to pave the way for improving the environment through sustainable events and business practices. With a primary focus on the hospitality industry, they are the go-to source on sustainability efforts within the Charlotte community. From hotels, meeting facilities, event producers, sponsors and hosts, the Charlotte Green Team is a portal for new practices, policies, programs, products, and technologies, understanding that environmental sustainability is necessary for our community and our businesses. Through quarterly meetings and events such as the vendor fair, the Charlotte Green Team continues to make strides towards their goal of transforming the way buildings and communities are designed, built and operated, enabling an environmentally and socially responsible, healthy and prosperous environment that improves the quality of life. 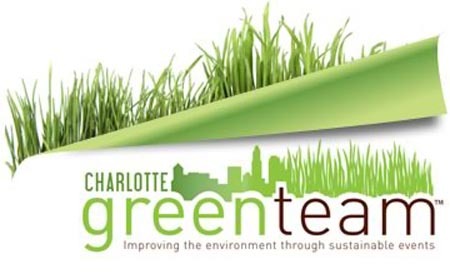 “The Green Team is happy to be hosting this event for members of the hospitality and event community, as well as other businesses in Charlotte who are looking to create a more sustainable approach to doing business,” said Mary Tribble. “And given the Charlotte Convention Center’s considerable efforts in making their facility a model of sustainability, it’s quite appropriate that the vendor fair be held there.” For more information, please visit www.charlottegreenteam.com. With an organization-wide vision of Southern hospitality and world-class customer service, the Charlotte Regional Visitors Authority (CRVA) seeks to ensure that the visitors and events that come to the area have a positive experience. Our responsibilities include destination marketing through Visit Charlotte and management/operations responsibilities for the Charlotte Convention Center, Time Warner Cable Arena (back of house operations), Ovens Auditorium and Bojangles’ Coliseum, and will include the NASCAR Hall of Fame currently under construction. Guided by three main mission objectives, the CRVA markets by bringing visitors and events to the Charlotte region, manages by making the visitors’ experiences positive and the events successful, and maximizes by marketing and managing in a way that continues to bring visitors and events back to the region.